Tower Peak is a highly prominent mountain on the northern Yosemite National Park boundary. It is a SPS Mountaineers peak. SPS groups will drive all the way up from L.A. to bag this moderately challenging peak. It is set in some of the most remote backcountry in the State. Our intent was to complete our climb in one two-day weekend. Most groups take three days. Three persons joined me for the long backpack and strenuous summit day. I had a good summer, so I was ready for this climb. For our first day, it was just a ten mile hike to get to base camp at Upper Piute Meadows. By the signs, it is a 15 mile hike, but I knew that was wrong. We began our hike in cloudy weather. It was to basically rain or remain overcast all weekend. There were some dry breaks. Starting from the Leavitt Meadows area, we took the good trail up the West Walker River Canyon. Passing some lakes, we alternately wore or took off rain gear as the weather dictated. At one point, a bear cub was up a tree. Whether it was stuck trying to get some food, or just scared of us, I don't know. I took some pictures. The terrain of the canyon floor is gentle, typical Sierra, rolling granite. I advised bringing the running shoes for this climb. 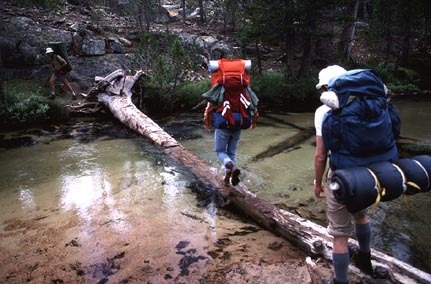 We crossed a log bridge over the main creek, then came to Piute Meadow. It was horse heaven for the USFS stock that was brought in there to graze. 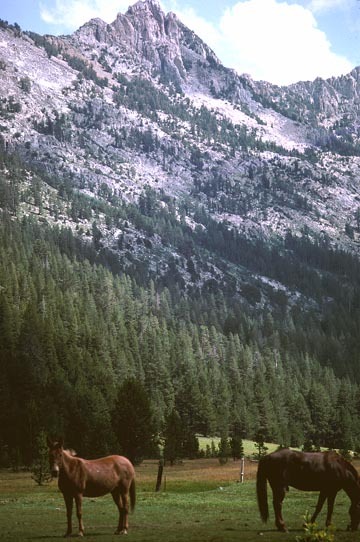 The granite peaks proved a scenic backdrop for these fine animals. One of the hikers immediately went fishing, upon reaching our campsite at Upper Piute Meadow. He caught a few small trout as we lounged about on logs about the campsite. Others had wanted to hike further. I saw no need. We would just have to backpack out that distance, the next day, and with the stormy weather, it was colder and windier up there at Tower Lake. That was another two miles up, and some twelve hundred feet higher. Once hiking, some people have the urge to keep going. Today, for what? The next morning, the weather was holding. We were to have about a 16 mile day. Hiking up to the lake in about one hour, we saw that snow covered much of our climbing route. It began to appear that we couldn't get to the peak. While the fisherman hiker had stayed in camp, not feeling well, the two others with me were both experienced climbers. I had said not to bring an ice axe, but one of them did. He had less trouble getting up the big snowfield. The other two of us used climbing technique to ascend along the edge of the snowfield. Some class 3 moves were needed. Thank goodness we got past this obstacle. On the bare ridge, we traversed in low clouds toward our goal. I had to guess from memory where the class 3 chute started up. Andy led the way, going by my directives. Finally, he must have been tired of my suggestions, and climbed directly up a chute. Yelling that he had made it, we followed. Yes! There was the register. 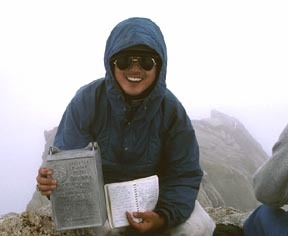 I read the sign-ins of other groups that had summited. This is a ritual for me, to check on claims, and to determine for records exactly who has signed in. Aside from people who genuinely never sign-in, I am roughly familiar with the people that climb from Northern California. If I haven't personally seen your sign-in, presumably made over the time period that the register book covers, then I will have some doubt. I had estimated that 10-20% of the local climbing claims I have heard are gleeful fabrication. "Tall tales are part of the fun," I was advised. Well, to falsely claim expertise and then set dangerous or foolish policies is an even more "fun" activity for some, apparently, especially when someone gets hurt. The local chapter supports it all. We signed in, then descended back below the clouds. Being my second time here, I was defeated in my aim for some summit photos. We couldn't see more than several yards. I planned to go back sometime, but it's not a real priority. I wore my rarely used Gore-Tex and pile jackets to keep me comfortable. The others chose woolens. There are often strong outings entreaties to "go light." The idea of snow, and even rain, are derided as crazy, by some, for summer. "This is California," said by some in a highly convincing tone. Many would naively agree. Back on the job Monday morning, I am given a strange look when I report "being snowed on" over the weekend. We were able to kick steps down the snowfield, then took the lake trail back. At some point, I must have lost the trail. We followed the creek, then came upon an unusual feature. A large snowbank formed a huge arch across the rushing stream. 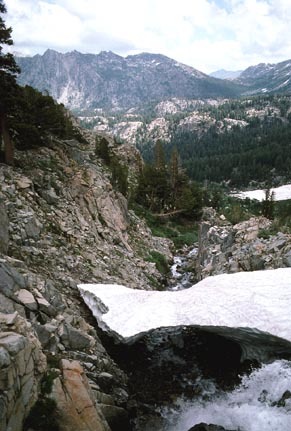 The water must have melted the snow from below, and left the curving snow bridge about ten to twenty feet above the creek. I wanted to take better pictures, but we had a long way to go. Back to camp, we readied our packs, then began the hike out. I took more photos of the horses in the beautiful setting. One of the others must have been tired, as profanity was yelled. The strenuous nature of this weekend had been made clear. I guess that it was too many cries of "wolf," that leads persons to disregard such warnings. Our hike back along the West Walker River was nice. It was flat or mostly downhill. At a series of cascading pools, Andy took the opportunity to dive in and swim. That was good for a photo. Many outings people have this polar bear mentality. And, not everyone gets up to the mountains as often as I do. The clouds grew thicker as we came back to the cars. It was about 7 p.m. There was still an hour of daylight. We had been successful on our time. Thanks to a good group! After dinner on the road, we came home by midnight. Our stats for the two days were some 28 miles, with 4,600' gain, round trip.